Do you notice the energy available when you open your heart? When you do not hunch over, but open up your heart space up to the sky? Have you noticed that when you root your feet more deeply in the earth, ground down through them, your heart space opens wider and your energy flows easier? Simple awareness of the energy and its flow into the heart space opens it up. When we pay closer attention to almost anything we gain a deeper understanding of it. 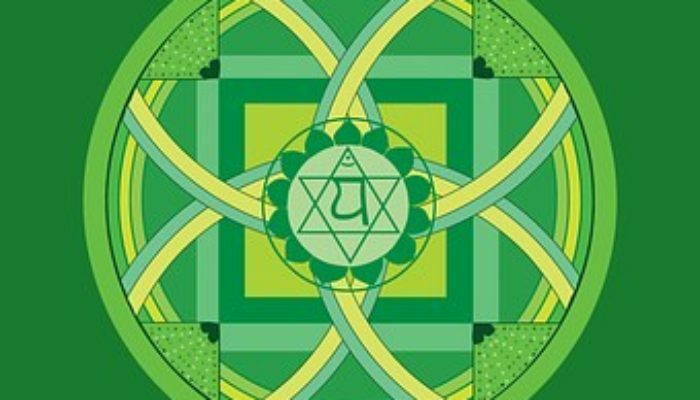 Many associate the heart with the color red, but in the chakra system the heart chakra, or Anahata, is green. Its symbol is a six- pointed star or two converse triangles – one triangle points up: the other down. The heart chakra is the middle chakra – the conductor, or conduit of earth and sky, matter and spirit. It sits on top of the yellow solar plexus chakra and beneath the blue throat chakra – a combination of the colors yellow and blue to make green. The converse triangles symbolize the heart space gaining its energy from the solar plexus and influencing our communication center or throat chakra. Acting and speaking from the heart refers to the combining of the yellow solar plexus, our power or action center, and the blue throat chakra, our communication center. When we speak our truth, we speak form the heart. When we act genuinely we act from the heart. May you always speak and act from your heart.